The next step in the evolution of wireless WAN communications - 5G networks - is about to hit the front pages, and for good reason: it will complete the evolution of cellular from wireline augmentation to wireline replacement, and strategically from mobile-first to mobile-only. So it’s not too early to start least basic planning to understanding how 5G will fit into and benefit IT plans across organizations of all sizes, industries and missions. 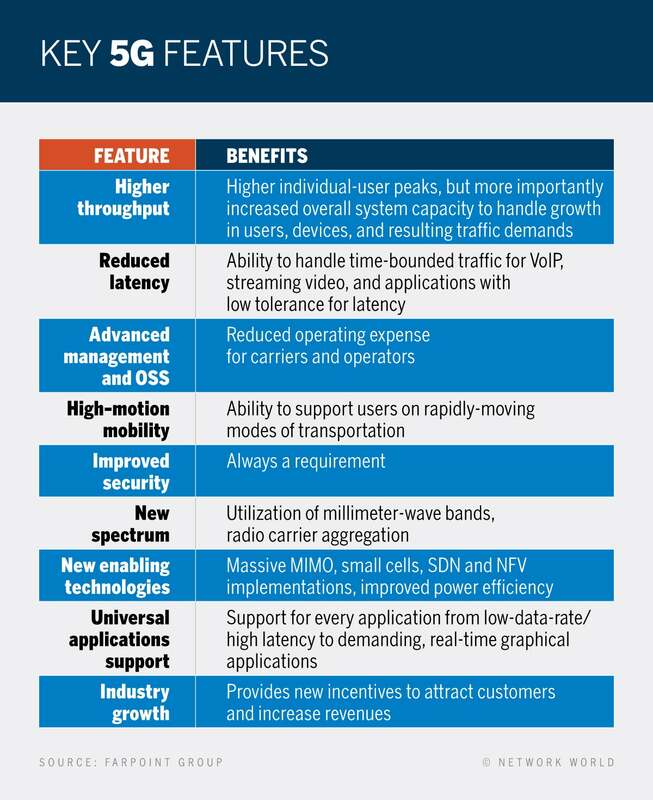 5G will of course provide end-users with the additional throughput, capacity, and other elements to address the continuing and dramatic growth in geographic availability, user base, range of subscriber devices, demand for capacity, and application requirements, but will also enable service providers to benefit from new opportunities in overall strategy, service offerings and broadened marketplace presence. A look at the key features you can expect in 5G wireless. This article explores the technologies and market drivers behind 5G, with an emphasis on what 5G means to enterprise and organizational IT. As is the case with Wi-Fi, major advances in cellular are first and foremost defined by new upper-bound throughput numbers. The magic number here for 5G is in fact a floor of 1 Gbps, with numbers as high as 10 Gbps mentioned by some. However, and again as is the case with Wi-Fi, it’s important to think more in terms of overall individual-cell and system-wide capacity. We believe, then, that per-user throughput of 50 Mbps is a more reasonable – but clearly still remarkable – working assumption, with up to 300 Mbps peak throughput realized in some deployments over the next five years. The possibility of reaching higher throughput than that exceeds our planning horizon, but such is, well, possible. Perhaps even more important than throughput, though, is a reduction in the round-trip time for each packet. Reducing latency is important for voice, which will most certainly be all-IP in 5G implementations, video, and, again, in improving overall capacity. The over-the-air latency goal for 5G is less than 10ms, with 1ms possible in some defined classes of service. Operators are always seeking to reduce overhead and operating expense, so enhancements to both system management and operational support systems (OSS) yielding improvements in reliability, availability, serviceability, resilience, consistency, analytics capabilities, and operational efficiency, are all expected. The benefits of these will, in most cases, however, be transparent to end-users. Very-high-speed user mobility, to as much as hundreds of kilometers per hour, will be supported, thus serving users on all modes of transportation. Regulatory and situation-dependent restrictions – most notably, on aircraft – however, will still apply.